The world dumps 11.2 billion pounds of trash every year, according to the United Nations Environment Programme. This leads to land-use issues, health problems through groundwater contamination, and global warming because of the release of methane gas. While more trash is a bad thing, it’s a pretty reliable indicator of economic activity and standards of living. Credit Suisse recently put out a report on global trends with a chart that reinforces the idea. 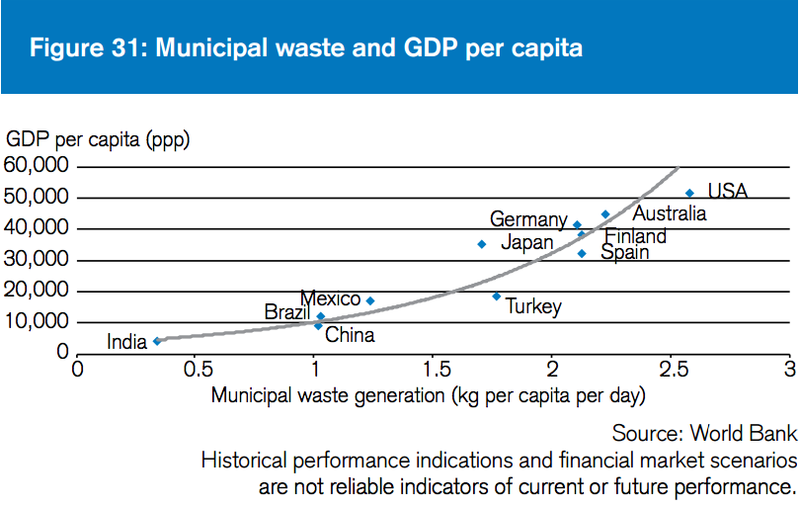 It shows a positive correlation in GDP per capita from various nations and the amount of waste created per capita per day. The US ranks highest in GDP and waste production, each person producing over 2.5 kilograms of trash per day. Following narrowly behind are large, developed economies like Germany, Japan and Australia. Further down the curve further are the emerging economies of Mexico, China, Brazil and India. The average Chinese person only produces 1 kg of trash a day and 1/5 of the GDP per capita of the US. So maybe if China wants to catch the US as an economic power it just needs to find more reasons to throw away more junk.